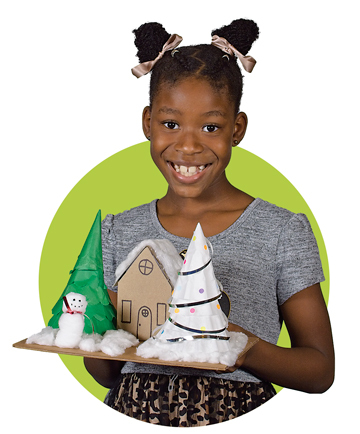 Make a Decoration or a Playset… and Have Fun! What belongs in your village? Build houses, schools, or a house of worship. 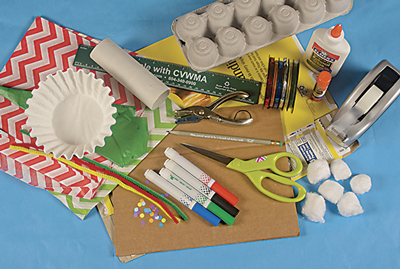 Make sleds, cars, or train cars from toilet paper tubes or small boxes. The bottom of a gallon jug might be a skating rink. Add snowmen or LEGO people or other play set villagers. Arrange the elements of your village on a piece of cardboard or another flattened cereal box and glue in place. Go for it! 1. Cut two coffee filters in half, and cut out about a quarter of the third filter. 2. Wrap one end of the filter section around the opposite side to create a cone, and attach with glue or tape. Repeat. 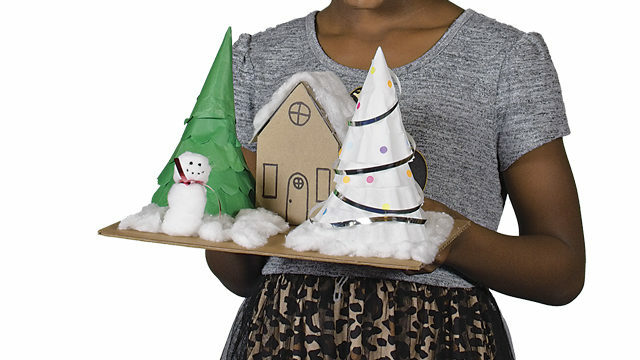 Make each cone slightly smaller than the cone before to stack on each other in the shape of a pine tree. 3. Use a small amount of glue to attach the cones to each other (optional). 4. Decorate with ribbons and paper or stickers. 5. Use green tissue paper to make an evergreen. 1. 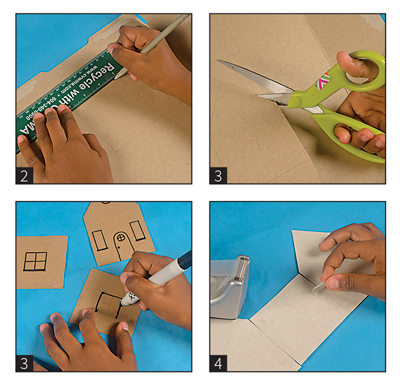 Cut open the cereal box (or other thin cardboard) and spread it flat on a table. 2. Using the ruler, draw the outline of the walls and roof of each building you want to build. 3. Cut out the walls of the building, draw doors and windows, and apply other decorations. 4. Tape or glue pieces of buildings together. 1. Glue cotton balls together to make snowpeople. 2. Make faces with marker or dots of paint, and add ribbon scarves. Previous articleWant to Expand Your Family? Central Virginia Waste Management Authority offers waste collection and recycling programs for residential use within thirteen localities in Virginia.